Naan bread made with yeast is nice, but sometimes I want to make flatbread fast. So I found a promising recipe for naan bread leavened with baking powder, and gave it a dairy free makeover. This recipe works in a skillet or oven, but I found it puffed up better in the oven on the “broil” setting. If you’d rather use a skillet though, simply follow the directions for cooking homemade flour tortillas. We love bread with kalonji seeds (also called nigella). Hence our favourite of many possible versions of naan is to sprinkle on the black seeds and roll them into the dough with a rolling pin. Pressing them in with my fingers did not work nearly so well. 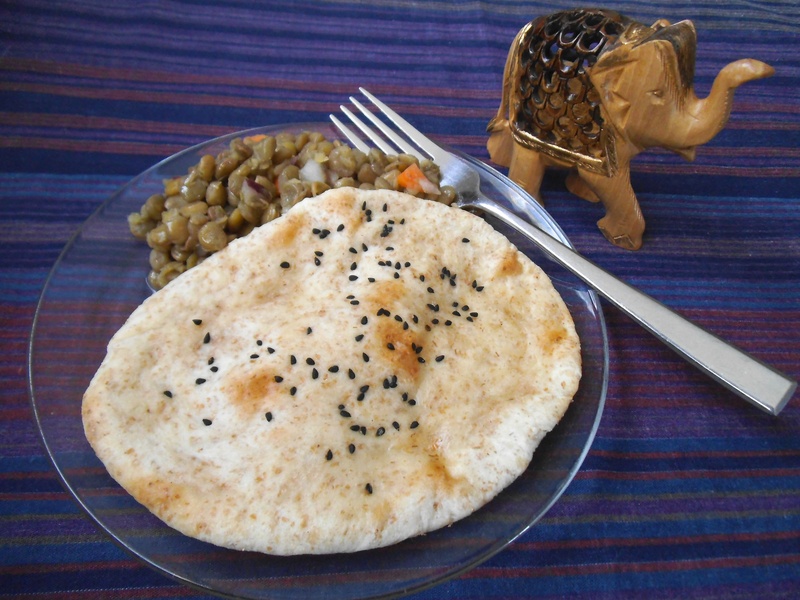 I served this naan bread with a savoury lentil salad (a la Serious Eats), but it would also pair extremely well with Mango Chicken Curry. After enjoying fresh naan for lunch twice this week, I think it might need to make more regular appearances. It certainly disappears quickly! Mix together flour, salt, and baking powder. In a separate bowl, blend together milk, oil, lemon juice and 1/2 cup water. Combine wet and dry mixtures, adding water gradually until a dough forms. Knead dough for about 10 minutes, until it becomes smooth and elastic. Place in a greased bowl, cover with a damp towel or plastic wrap, and let sit for 10 to 20 minutes. Preheat broiler to 500 degrees F (260 C). Place a heavy duty baking sheet or jelly roll pan in the oven to preheat on the middle rack as well. Divide dough into 8 portions. Use a rolling pin to roll each dough ball into a flat oval, about the size of your hand. Sprinkle with seeds and roll again. Place 4 rolled portions of dough onto the preheated baking sheet. Quickly return baking sheet to oven and bake dough for about 3 minutes, or until top begins to turn brown. Remove the baking sheet from the oven and spread margarine on each piece of bread while still hot. Cover the first batch to keep the bread warm while the second batch bakes. 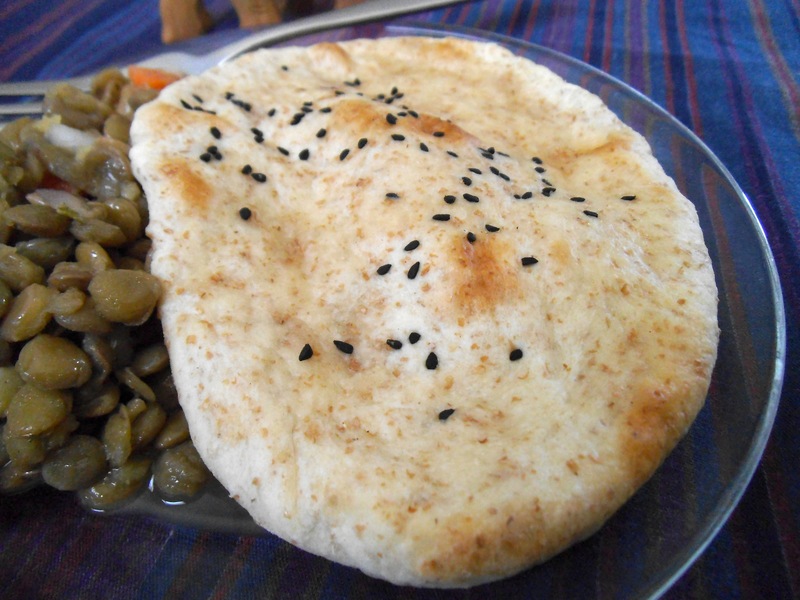 Serve naan bread warm with your favourite salad or curry. Find more recipe innovations at Allergy Free Wednesdays and Pennywise Platter. Yum! I have tried making naan before, but it wasn’t great. Yours looks great, so I might try your recipe next time! I’ve made these 3 times this week, so I think the odds of the recipe turning out well for you are very good! I have made naan before, but it was such a time consuming process. Love this version. Looks delicious. This is a pretty quick way to make it. The last time I made it, it took me 30 minutes from start to finish! Enjoy! I love that this uses baking powder for those times when I’m impatient! They look delicious and every bit as good as the yeast version! Yes, it is nice to have a quick option, especially when I’ve painted myself into a corner. Yeast doesn’t do corners very well. Being able to make fresh naan quickly opens a lot of possibilities. Love it!